Boats are a lot of responsibility, and using a trusted and durable truck like a Ram 2500 or 3500 to move and tow the boat is a part of that responsibility. If you plan on investing in a boat and you need a vehicle that can tow it to the boat ramp, go with Ram. Ram specializes in manufacturing trucks, so they developed innovative and helpful features that other manufacturers don’t offer. Not only are those features unique to Ram, but they make heavy-duty jobs like towing a boat easy and efficient. To help ensure the truck and cargo are level while towing, the Ram 2500 and Ram 3500 are available with a rear auto-level suspension. The rear auto-level suspension allows drivers to adjust the vehicle’s height in to two different ride heights with the push of a button and the system can also automatically electronically adjust the ride height to optimize performance while towing. The Ram 2500 and Ram 3500 are both available with a heavy-duty tow package that comes with a 30k hitch, fifth-wheel and gooseneck prep and the Auto-Level rear air suspension. The Ram 2500 with a max towing capacity of 17,980 pounds and the Ram 3500 with the highest available fifth-wheel towing capacity of 30,000 pounds and a gooseneck towing capacity of 31,210 pounds. The available cargo-view camera makes drivers feel a lot more confident when on the road. Located on the LED third brake light, the cargo-view camera provides drivers with a clear image of the cargo in the truck bed or behind the truck and let’s them monitor the cargo while in motion. Parking when towing something as large as a boat never gets easy or feels natural, and Ram’s available parking features are really helpful. In addition to the helpful cargo-view camera, Ram trucks are also available with ParkSense front and rear park assist as well as the ParkView rear back up camera system. The ParkView rear backup camera system provides drivers with a clear view of objects behind the truck while backing up and the ParkSense system features sensors that alerts drivers when the truck gets too close to objects so they can change direction or stop moving. A boat is too big of an investment to take your chances on a vehicle that is going to move it. Ram trucks are built to take on heavy-duty jobs and that includes everything from towing large boats to large horse trailers to RVs. Not only does Ram offer some of the most powerful engines on the market, but they also have features that make stressful towing scenarios a lot easier. 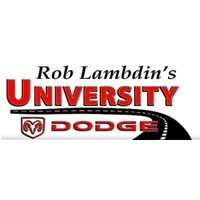 University Dodge Ram is the largest Ram truck dealer in Florida and the southeast U.S. and we have a large selection of Ram heavy-duty trucks like the Ram 2500 and Ram 3500 available. Come by and test drive them today.